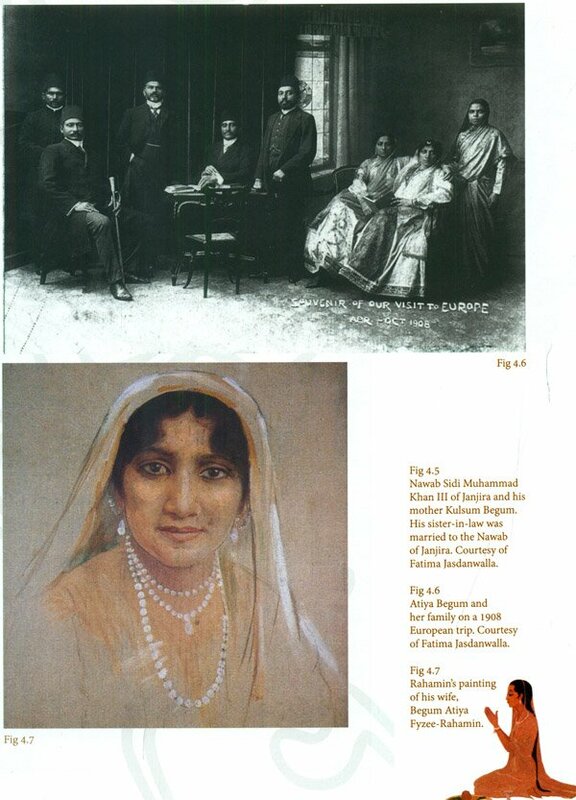 This volume reveals the roles of foreign and Indian Jews in the Indian National Art Project and raises many issues: Does the term "Indian artist" apply to any artist born into an Indian family? What role can foreigners and members of Indian minority groups play in the Indian National Art Project as scholars, critics, or artists? 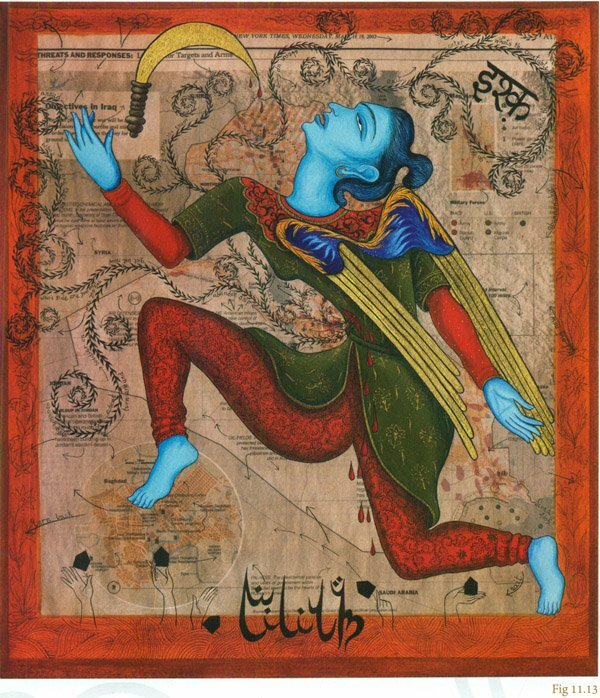 Is a piece of work dubbed "Indian art" because of its subject matter or its style? Is it possible to utilize "foreign techniques" in creating "Indian art"? Can the demands of personal individual creativity and the National Art Project be in dynamic tension with each other, or are they always in opposition? How can artists retrieve the connections to their roots without being limited by them? In what ways does the modernization and change in India reflect changes in other societies? How can artists transcend the hegemony of established Western modes of thought and creativity? Jews and the Indian National Art Project documents the contributions of artists such as Anna Molka Ahmed, Mirra Alfassa (The Mother), Siona Benjamin, Carmel Berkson, Esther David, Annie Heilig, Martha Isaacs, Gerry Iudah, Anish Kapoor, Andree Karpeles, Magda Nachman, Fyzee Rahamin, Sir William Rothenstein, Gladstone Solomon, Rudi von Leyden, Rebecca Yehezkiel, and Fredda Brilliant as well as those of photographers (David Mordecai and Man Ray) and architects (Otto Konigsberger and Moshe Safdie). Also covered in this volume are the works of critics, scholars, and art patrons like Ernst Cohn- Wiener, Charles Fabri, Stella Kramrisch, and Marion Harry Spielmann. Kenneth X. Robbins is a psychiatrist, collector, and independent scholar on South Asia, with particular interest in maharajas and other Indian princes, as well as the Rajputs, African Muslims, Chettiyars, Sikhs, missionaries, and Jews in South Asia. He has curated more than a dozen Indian exhibits and five scholarly conferences dealing with maharajas and nawabs, painting, women artists and political figures, medicine, and philately. His most recent exhibition projects deal with African Muslim elites and Jews in India. In addition to publishing more than seventy articles, he is co-editor of African Elites in India: Habshi Amarat (2006) and is working on a book about the princely state of Gujarat and several other volumes about Jews in South Asia. 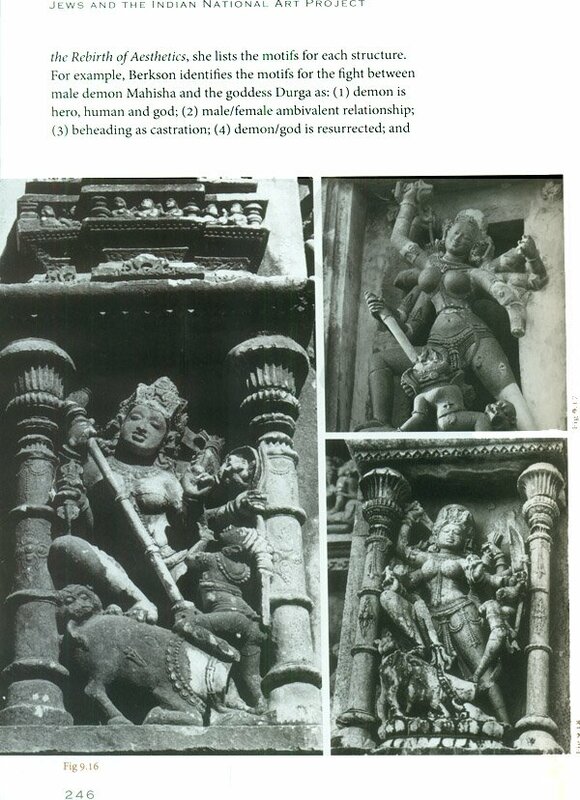 There was a time when no Indian sculptor or painter was widely recognized in India or the West as a great artist. 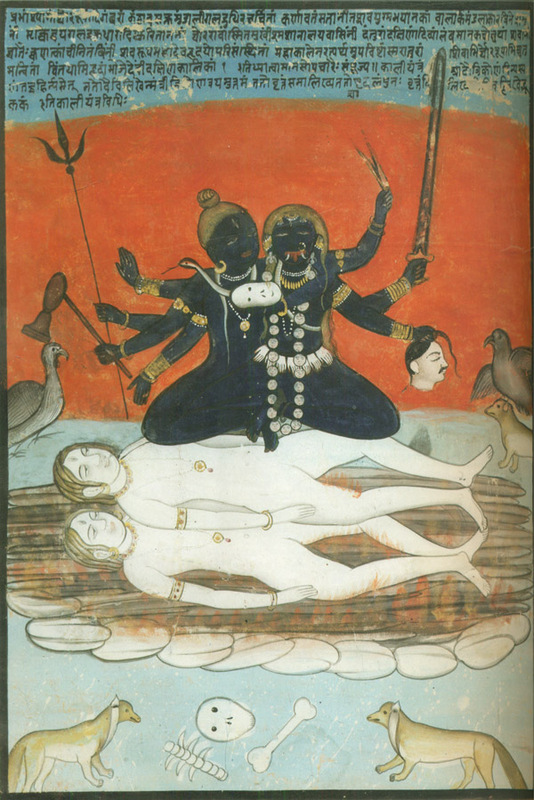 Many Westerners had asked if Indians were even "capable" of creating "fine art". When Picasso appropriated references to African masks or Kalighat paintings, he was hailed as a "universal genius': When an Indian artist referenced Picasso or Indian folk paintings, he was often considered a copyist. Indian artists and art history were judged in terms of a hegemonic Western tradition whose "linear trajectory ... does not allow for dissidence, difference and competition:' The articles in this volume take a different view in line with Partha Mitter's view of a two-way dialogic transaction of global modernity." India is a most diverse multicultural and multilingual place with a continuing flow of "immigrants" between different parts of the country. The movement to innovate and create Indian contemporary art in modern style has flourished because it evolved from the dynamic tension of maintaining both-the organic growth from Indian cultural roots and the expressions of individuality. 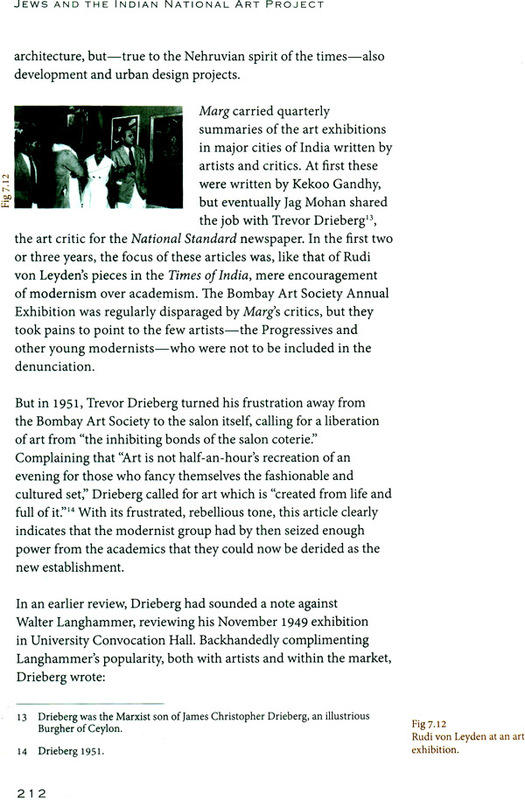 The Bombay artist-art critic-political cartoonist Rudi von Leyden, who was a refugee from the Nazis", wrote that modern Indian artists should not be "satisfied with readymade conventions of either the academic western or the academic traditional" because painting could be an "expression of the deeper emotions and striving of a generations." In 1951, another Jewish critic Charles Fabri wrote that the great problem of India was "to be a child of our own age, to speak the language of our day ... and not to be uprooted and deracinated from the native soil:' This volume deals with some of the contributions made by Jews to this cultural flowering. Most of them came from the West. Its articles reveal the importance of cross-fertilization and the benefits of their non - parochial approaches. 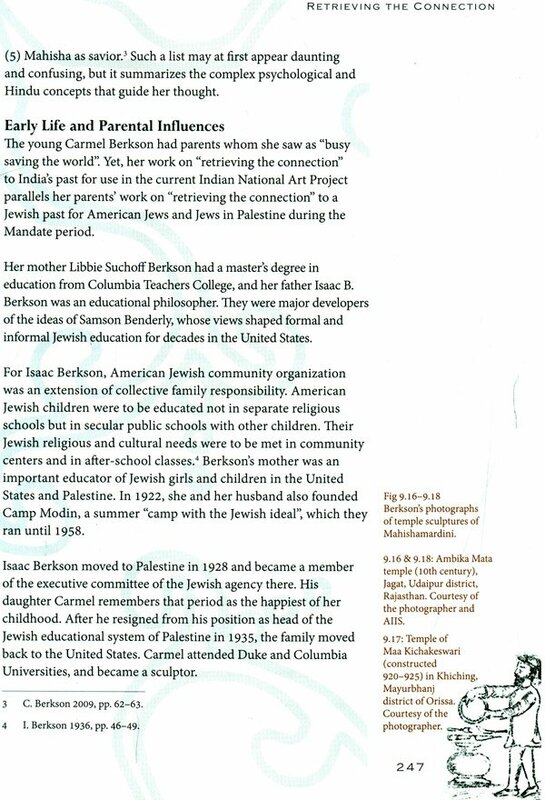 Most of these Jews did not function as "experts" who stifled local traditions and imposed alien uniform practices. They respected Indian heritage while encouraging further development and flexibility within that tradition. Many of the scholars and critics among them worked to help Indians express their own voices. Von Leyden praised the unique genius of India's artists, both past and present. He had a discerning eye for Rajput paintings, which he collected at a time when few others recognized their great aesthetic merit. He favorably compared the painter Jamini Roy's absorption of elements of primitive designs from village textiles, pottery and Bengal patuas with the work of modern Western artists inspired by African carvings. 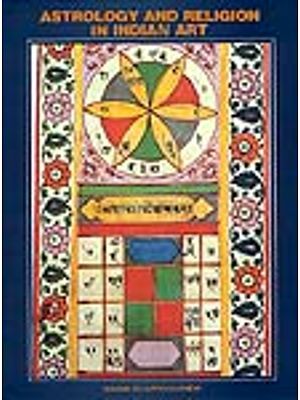 He was a pioneer in the study of ganjifa, the beautiful painted playing cards of India. 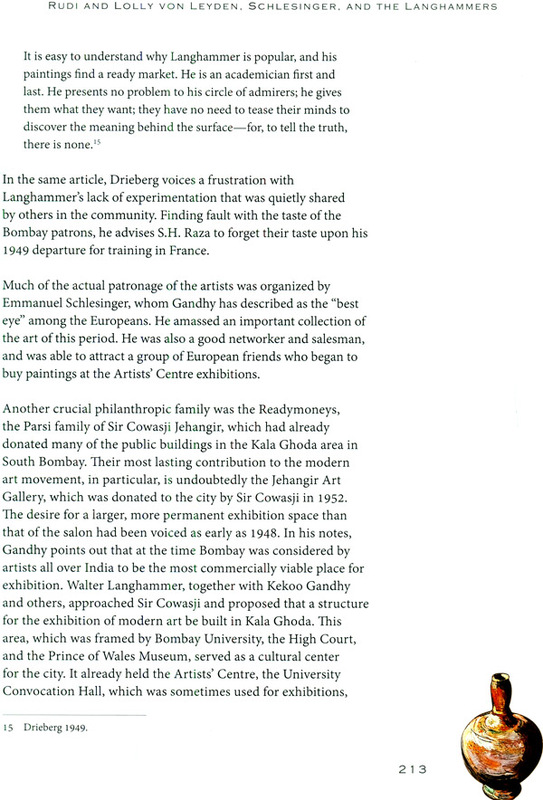 According to his friend Kekoo Gandhy, "Rudi was regarded as the father figure of the emerging modern Indian art movement of the day" and encouraged the development of artists in the Progressive Artists' Group. These Indian artists developed individual styles and are considered among the greatest Indian artists of the twentieth century. S.H. Raza, after being encouraged by Walter Langhammer to compare works by European masters with Indian miniature paintings, spent years in Europe. This made him more aware of being an Indian and he began to feel the draw of my Indian heritage .... I come from India. I have a different vision; I should incorporate what I have learned in France with Indian concepts .... I visited India every year to study Indian philosophy, iconography, magic diagrams [yantras], and ancient Indian art, particularly Hindu, Buddhist, and Jain art. 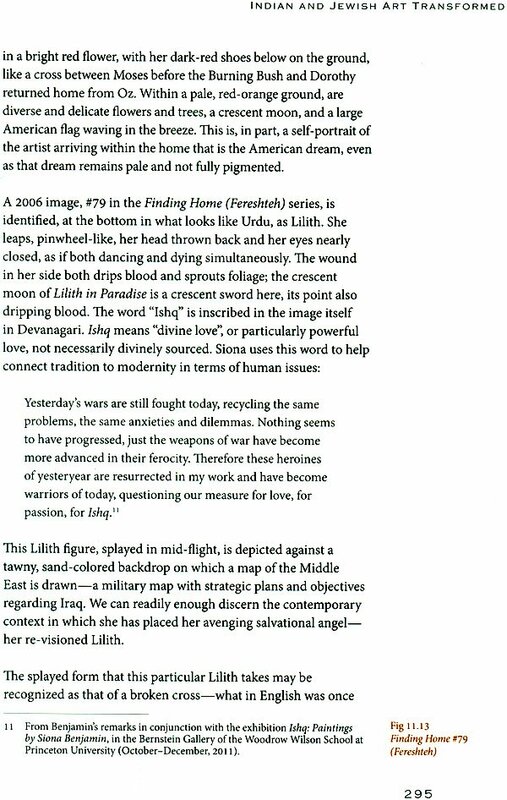 I was impressed by paintings from Basholi, Malwa and Mewar, and began combining calors in a manner that echoed Indian miniature painting." 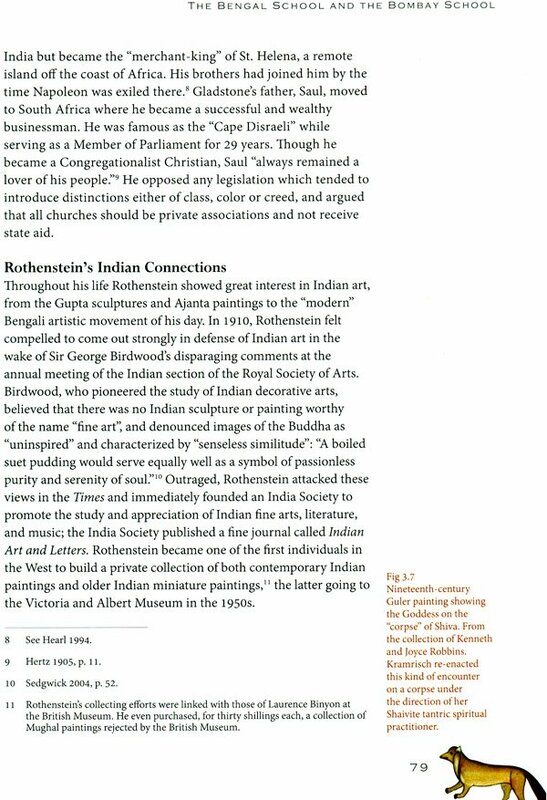 Even before the rise of Hitler there were a number of European Jews already involved with Indian art. 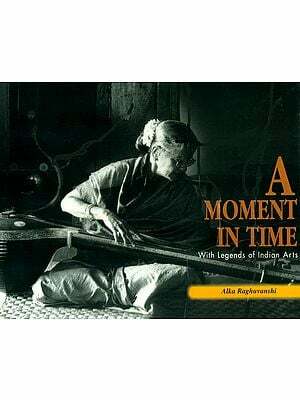 The art historian Stella Kramrisch played a major role in upgrading Western and Indian opinions about Indian art history and India's twentieth -century artists. In 1922, she was largely responsible for a pioneering Calcutta exhibit under the auspices of Rabindranath Tagore. Paintings by Indian artists were displayed alongside about 175 paintings by Klee, Kandinsky, and other Europeans. (A painting by Sophie Korner, who later perished in the Holocaust, was purchased by a member of the Tagore family; the only sale of the exhibition). The following year there, was an exhibition by Bengal School artists at Berlin's National Gallery. 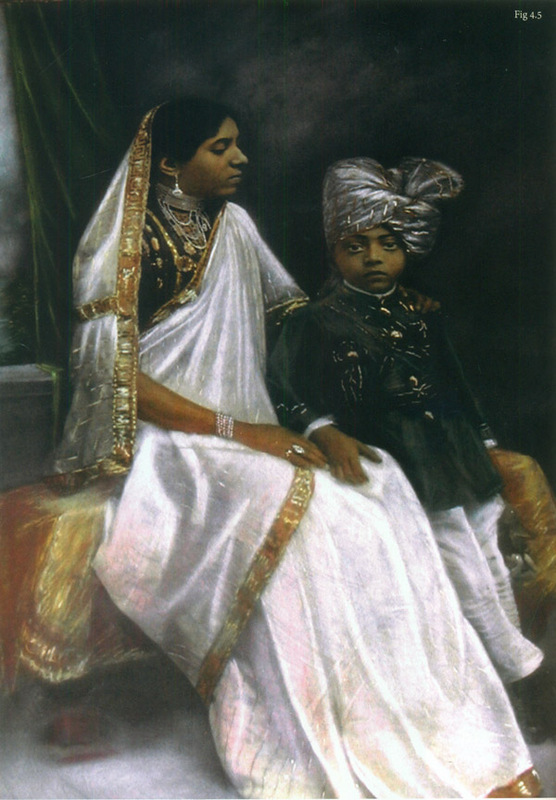 In her Catalog of the Fourteenth Annual Exhibition of the Indian Society of Oriental Art [Calcutta 1922], Kramrisch wrote: The Indian public should study this exhibition, for then they may learn that European art does not mean "naturalism" and that the transformation of the forms of nature in the work of an artist is common to ancient and modern India and Europe as an unconscious and therefore inevitable expression of the life of soul and of artistic genius. Today, the sculptor-scholar-photographer Carmel Berkson encourages Indian artists to focus on "retrieving the connection" to "depth encounters with the great sculpture of India" rather than slavishly following Western norms. Her unique understanding of Indian aesthetics and mythology allows her to create sculptures that retain the structural configurations and iconographical conventions of classic Indian religious sculpture while working well as "modern" creative works. She has also stressed the importance of traditional modes of knowledge transmission.